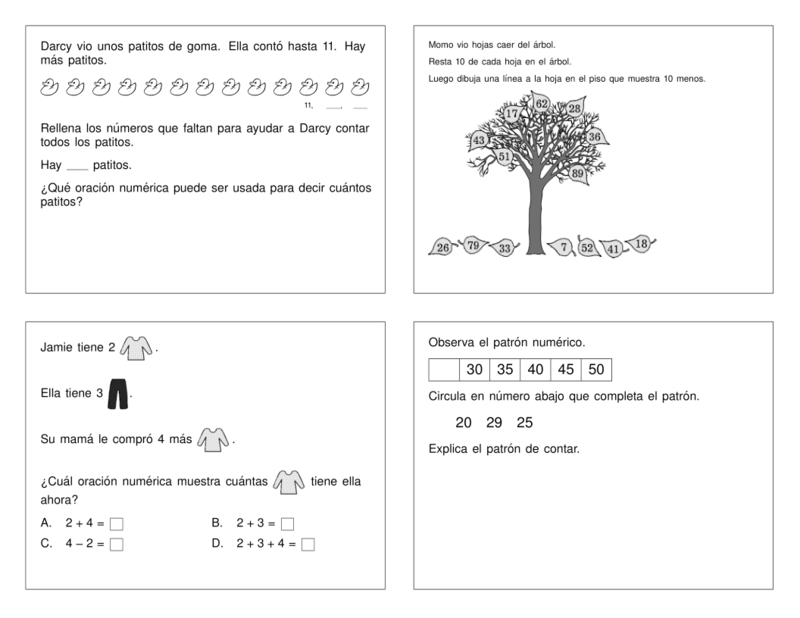 Problem-Attic has 8000 elementary math questions in Spanish. There’s a one-to-one match with the grade 1–5 questions in English for CCSS and TEKS, and switching between the languages is fast and easy. The Spanish questions are available to school subscribers. You’ll see the link on the main Select page in the bottom-right panel. Of course you can drill down into the database and pick the exact questions you like. Or you can create the English version of a document and let Problem-Attic automatically change your selections to Spanish. Examples of language switching (English/Spanish). Please note that language-switching is one of two options for creating “parallel forms”. The other option takes advantage of Problem-Attic’s pairing of odd/even questions. It’s for creating make-up tests, pre- and post-tests, etc. You can read about it here. What follows is a quick lesson on how to create matching documents in English and Spanish. Even if you don’t need the translated questions, you might want to go through the steps to learn some selection shortcuts and options for starting new documents. If your school has a bilingual/ESL program, please share this information with your colleagues, so they’re aware of the options. Log in to Problem-Attic and start a new document. Give it a name like “Math questions in English”. 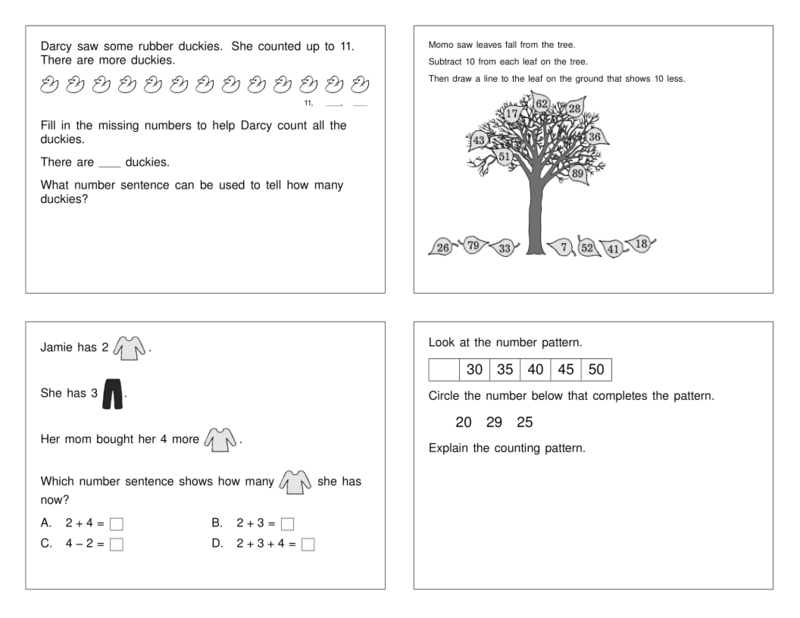 On the main Select page, click either Common Core or Texas TEKS in the middle panel (Math Standards). 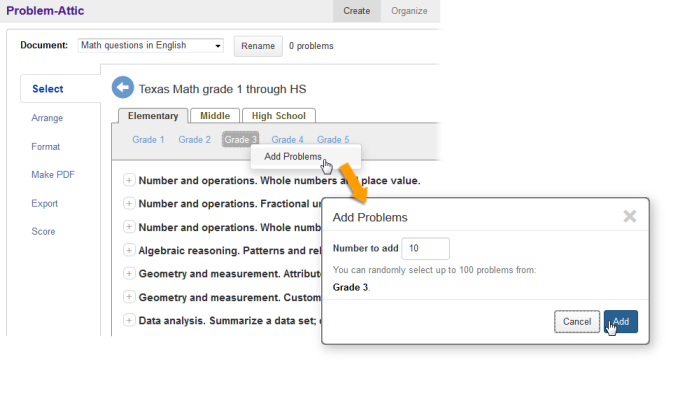 Click the Elementary tab, then try Problem-Attic’s right-click option to select a certain number of questions at random. The option works at any level. 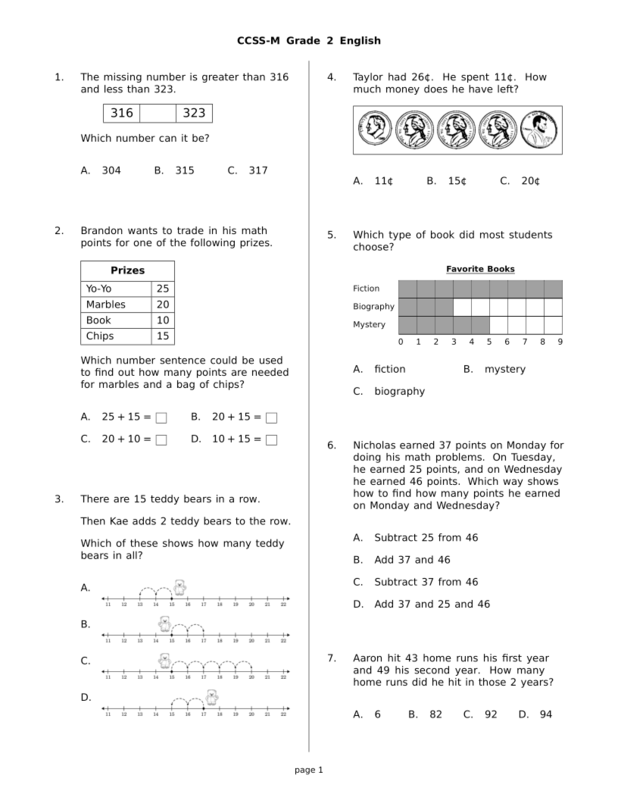 For example, you can right-click on Grade 3 and choose Add Problems, as shown below. Or you can do the same thing at a lower level, for one of the TEKS or Student Expectations. In the Add Problems dialog, type a number like 10, then click the Add button. Make any changes you like on the Arrange and Format tabs. Then click Make PDF and download your document. In the New dialog, type a name like “Math questions in Spanish”. You will see the question, What would you like to start with? Choose “Copy of”. To the right, you should see the title of the English document that you just worked on. If not, browse for it. Now you will see Options for parallel forms. 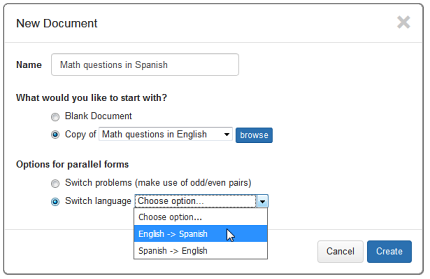 Choose “Switch language”, and in the drop-down menu, choose “English ➝ Spanish”. Then click Create. That’s it! You should have two documents with matching questions in English and Spanish, like those shown above. Problem-Attic does not do any translations on the fly. Language switching works only with questions which are already translated and stored in the database. Currently that’s true for math grades 1–5 for Common Core and TEKS. Language switching works in either direction. You can choose Spanish first and then switch to English, or do a “round trip”. While questions will match, page layout may be slightly different between English and Spanish, because of changes in the number of words. You can usually adjust workspace to compensate for this, so that pages show the same questions. This feature works with all document types. So you can do some interesting things, such as making flash cards in two languages. If you cleverly arrange the questions for your printer, then you can create the cards with English on one side and Spanish on the other.